Earlier he had bustled into a room in the building where he and other actors have been rehearsing Martin McDonagh’s play The Cripple of Inishmaan, which is soon to open in the West End of London. Radcliffe seems unaffected by fame, despite being famous globally for more than a decade for playing Harry Potter. He apologises profusely for being late, then matches a politeness and interest in the people around him with, apparently, a curious insecurity – or, at least, a realisation of the frailties of stardom. Nearly everything about the 23-year-old works at speed, and his enthusiasm for acting shows no sign of abating, 14 years since he was first noticed in a 1999 TV version of David Copperfield. The opportunity to play the lead in The Cripple of Inishmaan was unbelievably fortunate, he says, following an offer from the theatre producer Michael Grandage to appear in any one of three or four plays given to him to read. Radcliffe’s interest in McDonagh dates back to In Bruges, the playwright’s cult film from 2008 about two Irish hitmen, played by Brendan Gleeson and Colin Farrell, hiding in the Belgian city after a job goes wrong. It is one of his favourite films, “an obsession of mine for a period”, he says, his words tumbling out. “I loved that kind of dialogue, that kind of economical dialogue where there is a real joy taken in every character having their own rhythm. I think that is always a sign of great writing. Radcliffe plays Billy, a disabled 17-year-old living on Inis Meáin who desperately wants to escape his dull life by travelling to the largest of the Aran Islands, Inis Mór, to win a role in the 1934 film Man of Aran. An explanation for Billy’s disability is never given in the play. 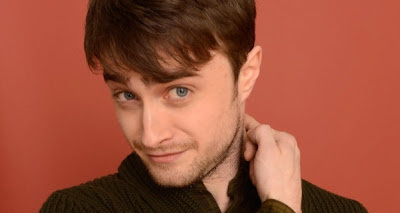 Radcliffe has chosen to play him as a man with cerebral palsy, helped by a coach who has the condition. “It has been amazing to learn from her the mechanics and what causes it. It is just another thing that I know about that I didn’t know about before. “Really, I don’t want to say how amazingly hard people’s lives are. I recommend that you watch [the documentary] Don’t Drop the Baby. It’s about a couple with cerebral palsy who are getting ready to have their second child. They want to have it by natural birth. That really showed me. Our perception is that their lives must be an incredible struggle all time, but actually it is just their life. They don’t particularly think about it on a day-to-day basis,” he says.